It’s easy to compose a song and fit it in any film, it’s easier to compose a song for a film and call it situational even when it does not has any shelf life but it’s the most difficult to make your audience enjoy situational songs outside the film. 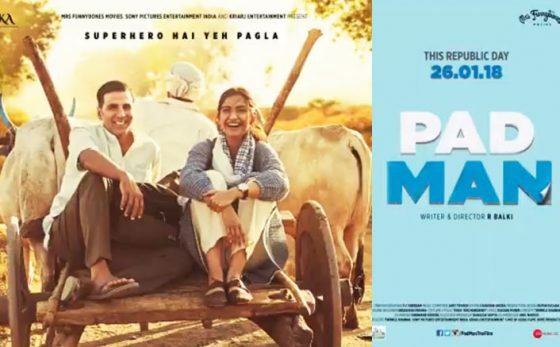 Amit Trivedi with Akshay Kumar’s Padmancontinues this trend of making the situational songs entertaining. Here’s our Padman music review! The song brings back the melodious combo of Amit Trivedi & Arijit Singh. It’s a post-wedding song describing the feelings of Lakshmikant (Akshay Kumar) for his wife Gayatri (Radhika Apte). Backed by beautifully written lyrics by Kausar Munir, the song is a delightful listen. Arijit’s husky voice complements the situation of the song very well. This surely will sound even better in the film. Sung by Mika, this song is the perfect title song we’ve seen recently in any film. As the name of the movies suggests how Akshay Kumar is some kind of superhero, this song describes how he’s not your usual superhero. With the additional vocals of local women singing ‘super hero’ in the background gives this the required desi feel. It’s amazing how Kausar Munir has made this song enjoyable with his quirky lyrics even after such an abstract title. The master Trivedi takes the driver seat in this one. A sweet mixture of electronic music maintains the quirky pace of the song. Kausar’s lyrics in this one hints at how two people have same ideologies. This will be a situational song and lyrics are hinting at the character of Akshay falling for Sonam or Sonam’s one-sided love for Akshay in the film. Whatever the situation may be, the song will surely work well in the film. Mohit Chauhan fans! He’s back & Saale Sapne is the best song on the album for me. Amit Trivedi’s trademark soothing music, Mohit’s treat-to-the-ears voice & Kausar’s dreamy lyrics make this song special. The song is a sweet little conversation with one’s dream. You never understand what the song is about until you’re not into half the song. This surely takes time to register but once it’s there you want to hear more of it. Perfect situational song! The only one from the album which I feel will sound better in the film. The inclusion of desi dhols & Indian instruments is a quirky touch by Trivedi and complements will to the lyrics by Kausar. It is a wedding song framing its reference from a girl’s perspective. Beautifully sung by Yashita Sharma, Jonita Gandhi, Yashika Sikka & Rani Kaur – the song will attract its target listeners and also will find its way through some daily soaps. Usually, when you do a movie on serious issues, the only music which matters is background music. But, the makers of Padman made it clear, by roping in someone like Amit Trivedi, that they want some amazing songs too. The songs will surely add to the sweetness of the film trying to tone down the way of handling such sensitive issue in the film.